Early attempts at the construction of artificial ice rinks were first made in the 'rink mania' of 1841-44. As the technology for the maintenance of natural ice did not exist, these early rinks used a substitute consisting of a mixture of hog's lard and various salts. 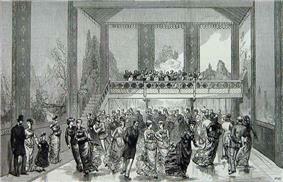 An item in the 8 May 1844 issue of Littell's Living Age headed "The Glaciarium" reported that "This establishment, which has been removed to Grafton street East' Tottenham Court Road, was opened on Monday afternoon. 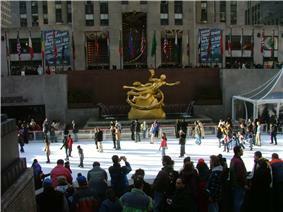 The area of artificial ice is extremely convenient for such as may be desirous of engaging in the graceful and manly pastime of skating". By 1844, these venues fell out of fashion, as customers grew tired of the 'smelly' ice substitute, and it was only thirty years later, that refrigeration technology had developed to the point that natural ice could finally be feasibly used in the rink. The world's first mechanically frozen ice rink was the Glaciarium, opened by John Gamgee in a tent in a small building just off the Kings Road in Chelsea, London, on 7 January 1876. 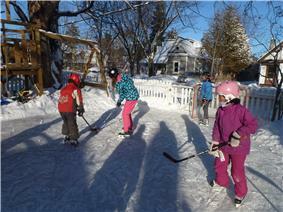 In March, it moved to a permanent venue at 379 Kings Road, where a rink measuring 40 by 24 feet was established. The rink was based on a concrete surface, with layers of earth, cow hair and timber planks. Atop these were laid oval copper pipes carrying a solution of glycerine with ether, nitrogen peroxide and water. The pipes were covered by water and the solution was pumped through, freezing the water into ice. Gamgee had discovered the process while attempting to develop a method to freeze meat for import from Australia and New Zealand, and had patented it as early as 1870. The rink initially proved a success, and Gamgee opened two further rinks later in the year: at Rusholme in Manchester and the "Floating Glaciarium" at Charing Cross in London, this last significantly larger at 115 by 25 feet. The Southport Glaciarium opened in 1879, using Gamgee's method. 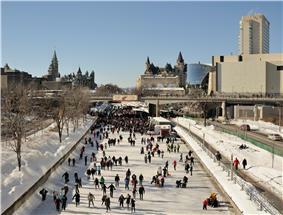 A famous example of this type of rink is the Rideau Canal Skateway in Ottawa, Canada, estimated at 1,782,000 square feet (165,600 m2) and 7.8 kilometres (4.8 mi) long, which is equivalent to 90 Olympic size skating rinks. The rink is prepared by lowering the canal's water level and letting the canal water freeze. The rink is then resurfaced nightly by cleaning the ice of snow and flooding it with water from below the ice. The rink is recognized as the "world's largest naturally frozen ice rink" by the Guinness Book of World Records because "its entire length receives daily maintenance such as sweeping, ice thickness checks and there are toilet and recreational facilities along its entire length". The longest ice skating trail can be found in Invermere, British Columbia, Canada, on Lake Windermere Whiteway. The naturally frozen trail measures 29.98 kilometres (18.63 mi). When the record was verified in 2014, the ice measured between 30.48 centimetres (12.00 in) and 76.2 centimetres (30.0 in) depending where you were in one of the four loops that runs continuously around the lake. Modern rinks have a specific procedure for preparing the surface. With the pipes cold, a thin layer of water is sprayed on the sand or concrete to seal and level it (or in the case of concrete, to keep it from being marked). This thin layer is painted white or pale blue for better contrast; markings necessary for hockey or curling are also placed, along with logos or other decorations. Another thin layer of water is sprayed on top of this. The ice is built up to a thickness of 3/4ths an inch to 1 1/2 inches. The industry standard in the NHL is around 1 1/2". Periodically after the ice has been used, it is resurfaced using a machine called an ice resurfacer (sometimes colloquially referred to as a Zamboni- who are a major manufacturer of such machinery). For curling, the surface is 'pebbled' by allowing loose drops of cold water to fall onto the ice and freeze into rounded peaks. A highly specialized form of rink is used for speed skating; this is a large oval (or ring) much like an athletic track. Because of their limited use, speed skating ovals are found in much fewer numbers than the more common hockey or curling rinks. Those skilled at preparing arena ice are often in demand for major events where ice quality is critical. The level of the sport of hockey in Canada has led its icemakers to be particularly sought after. One such team of professionals was responsible for placing a loonie coin under center ice at the 2002 Winter Olympics in Salt Lake City, Utah; as both Canadian teams (men's and women's) won their respective hockey gold medals, the coin was christened "lucky" and is now in the possession of the Hockey Hall of Fame after having been retrieved from beneath the ice. In bandy, the rink size is 90–110 m (300–360 ft) x 45–65 m (148–213 ft). For internationals, the size must not be smaller than 100 metres (330 ft) x 60 metres (200 ft). Official National Hockey League rinks are 26 m × 61 m (85 ft × 200 ft). The dimensions originate from the size of the Victoria Skating Rink in Montreal, Canada. Official Olympic/International rinks have dimensions of 30 m × 60 m (98.4 ft × 197 ft). In speed skating, for short track, the official Olympic rink size is 30 x 60 meters, with an oval ice track of 111.12 meters in circumference. In long track speedskating the oval ice track is usually 400 meters in circumference. ^ Redmond, Gerald (1982). The sporting Scots of nineteenth-century Canada. Toronto, Ontario: Associated University Presses Inc. p. 271.